Such cuteness in these new behind the scenes pictures from the set of 'Untitled Terrence Malick Project'. People magazine got it right "Why a dog made us jealous ... and a horse!" "Leave it to Ryan Gosling to smile at a passing pooch and stir up all kinds of feelings: jealousy, spitefulness, despair. The actor, along with costar Rooney Mara, is currently spending long days on set for the untitled picture, and seemed to relax momentarily on Wednesday when a crew member brought over the dog between takes. 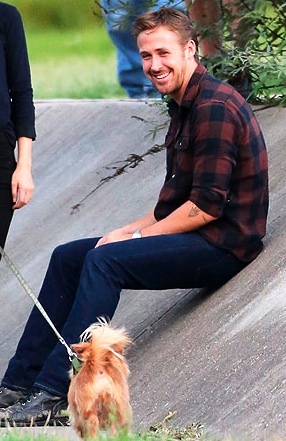 Gosling had another encounter with the furry kind on Thursday when he filmed a scene with Mara next to a horse. There is no photographic evidence to suggest that the horse got so much as a "Hay, girl!" or even a goofy grin from Gosling, but we still managed to feel jealous of the horse, too." Ryan Gosling moving to Australia?